So you’ve done your festival homework, studied the runners and riders, predicted the going that’ll suit your selections and followed the advice to get in early and pick-up the value available in the Cheltenham Festival antepost markets. But being first isn’t always the best strategy. There promises to be as much drama in the run-up to this year’s four-day meeting at Prestbury Park as there will be after the first flag drops. Connections are keeping their cards close to their chest as they plan an attack. Big names expected to run in one Cheltenham horse race still have time to cement a place in another, causing a reshuffle of thinking from traders and trainers. One team still to make their feelings known is Douvan’s handlers. The ever-popular eight-year-old has looked a certainty to run in the Champion Chase for some time now, following last year’s failed effort in the same race when finishing seventh, but there could be a spanner in the works. Douvan disappointed at this level 12 months ago when getting nowhere near the prizes despite going off a 2/9 favourite. He did lead in the early part of the race, but a couple of mistakes meant the gelding was soon going backwards through the field, allowed to see out the trip by Ruby Walsh. The injury suffered was obvious to all in attendance. William Hill’s horse racing squad have him a 9/2 third-favourite behind Altior and Min to right the wrongs of that day. A crack at the Ryanair may be seen as a better approach and those loyal to Willie Mullins’ rep will certainly hope so, as there’s a chunky 8/1 available on him running in and winning a race dominated by Un De Sceaux. The latter may be viewed as a more beatable horse than great rival Altior. Whatever the final decision, Douvan is sure to out-run his price and was reported as being in great form by those closest to him. Despite last year’s flop, he has already won the Supreme Novices and Arkle Chase in previous goes. You’ll find many similarities with Monalee, who could trade his place in the RSA Chase for a crack at winning the JLT Novices Chase. The seven-year-old, owned by Barry Maloney and trusted into the capable hands of Henry de Bromhead, will find his odds for Cheltenham marked at 7/2 to win the RSA a week before the race, placed one behind antepost favourite Presenting Percy. He has run only once at this venue before, finishing second to Penhill in the Albert Bartlett 12 months ago. Monalee ridden by Noel Fehily jumps the last to win The Flogas Novice Steeplechase. There’s more to get excited about in the odds if he was pushed towards the JLT instead, with 5/1 the best of the value there, second-favourite behind Invitation Only. 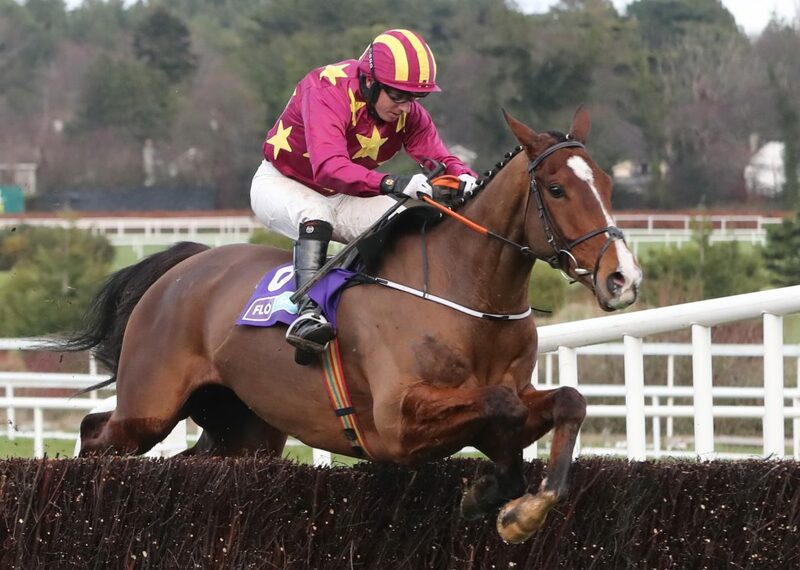 The latter doesn’t do too much to impress on paper, falling at Punchestown recently and finishing third in the Flogas Novice Chase at Leopardstown last time – a race won by Monalee. The victor’s jumping was sound that day and he finished a deserved champion of the prize money. Invitation Only was, again, a bit unsteady on his feet. If they were racing at Cheltenham today you’d fancy Monalee to hold his ground.